This piece of paper is probably a tobacco wrapper rather than a tradecard or leaflet, and is advertising A. 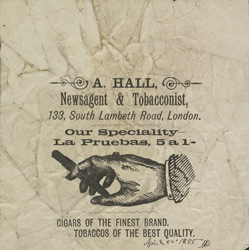 Hall, a newsagent and tobacconist. Mr. Evanion has written 'April 24th 1895' on the wrapper. Production of cigars began in Britain in 1820 and smoking became a widespread custom, even influencing clothing, like for example, the smoking jacket. Because of an import tax, foreign cigars would have been very expensive and would have been seen as a great luxury.